In 2012, at age 12, Deryn Blackwell became one of 5 people in the world to contract Langerhans Cell Sarcoma, a type of leukaemia that’s as under-researched as it is rare. 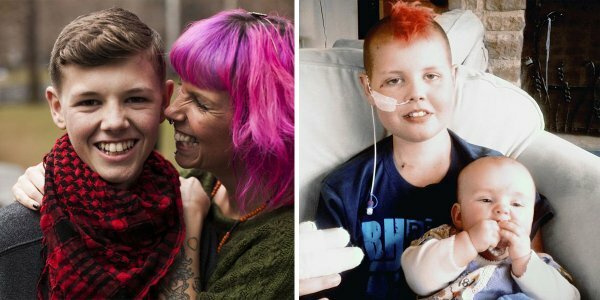 His doctors recommended a bone marrow transplant, a procedure that Deryn Blackwell had to undergo four times before it cured him. However, during recovery from his fourth transplant, he’d picked up a superbug infection his body couldn’t fight off. His white blood cell count was so low that his immune system had been supplemented with antibiotics – which is ineffective against superbug infections. Deryn was, therefore, given between three days to a week to live. But his mother, Callie Blackwell, wasn’t ready to give up and, desperate to save her son’s life, sought an alternative. Cannabis. It is, to this day, illegal in the UK to be treated with cannabis. Callie had, at first, ignored it as a viable alternative and opted for fentanyl (a pain killing opioid stronger than morphine). But after seeing its ill effects on her son, she asked her doctor for bedrocan – a cannabis based treatment available in Europe. Doctors, at their own risk, are allowed to prescribe cannabis based treatments to their patients but no persons are allowed to treat themselves within the UK. Nonetheless, Callie proceeded to treat her son with bedrocan and saw that within an hour he’d achieved compos mentis (full control over his own mind), which he could not on fentanyl.
? Scientists Develop A Virtual Reality System That Improves Violent Offenders’ Ability To Empathise With Victims Terrence Deacon: Incomplete Nature, How Mind Emerged From Matter ?